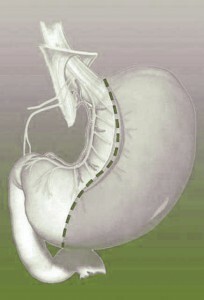 Sleeve gastrectomy has evolved as a bariatric procedure over the last two decades. It was introduced as the restrictive component of the biliopancreatic diversioon. Subsequently after 10 years, laparoscopic s leeve gastrectomy was used as a bridging procedure in super-morbidly obese patients, usually followed by a definite procedure as laparoscopic Roux-en-Y gastric bypass or biliopancreatic diversion and duodenal switch. Laparoscopic Sleeve gastrectomy as a stand-alone procedure has since grown throughout the world and has been verifed by the First and Second International Consensus Summit for Sleeve Gastrectomy in 2007 and 2009, respectively, as a safe and feasible bariatric procedure. 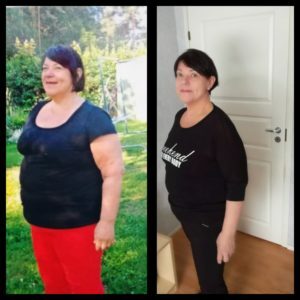 It is a restrictive procedure, but with the removal of the fundus of the stomach, it reduces the volume of the glands that produce ghrelin and thus also functions as an appetite suppressor. Not only is the excessive weight loss after LSG sufficient and lasting in many patients, but there are no necessary anastomoses, the remaining stomach is still approachable for endoscopy, and postoperative supplementation of vitamins and micronutrients is rarely required. However, LSG has a specific morbidity pattern in which gastric staple line leak is the main complication. Although gastric leak after LSG occurs in less than 5% of patients, it significantly increases the hospidal length of stay and can be lifethreatening. Gastric Sleeve Surgery may not be an option for peole, who have significant issues with a hiatus hernia or a history of severe gastroesophageal reflux disease. This is because once the gastric sleeve procedures is perfomed, further gastric reflux surgery generally cannot be done.